Cantharolethrus homoderoides KRIESCHE, considered a Costa Rican endemic, is now reported from two Nicaraguan localities: Mt. Saslaya and Jesus Mountain with very different ecological conditions. The new subspecies Cantharolethrus steinheili kirchneri from Peru is described and compared with the nomino-typical taxon Cantharolethrus steinheili steinheili from Columbia. The Catalogue of Lucanidae is an updated listing of the species, subspecies and synonyms of the family Lucanidae. In this issue of Beetles World a synopsis of the genus Cantharolethrus J. Thomson, 1862 is given. Distribution, type locality, type depository and size of the taxa are indicated. Taxonomical comments are given and Cantharolethrus elongatus Lacroix, 1982 has been identified as a new synonym of Cantharolethrus peruvianus Heller, 1918. A determination key for the Cantharolethrus taxa is given. 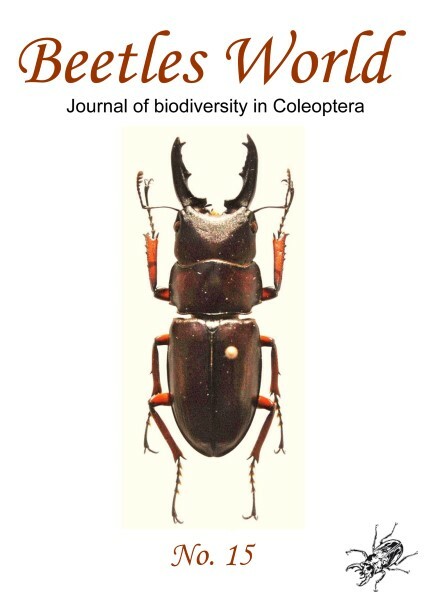 The Catalogue of Lucanidae will be continued in further issues of this journal. A new species of the genus Prosopocoilus Hope et Westwood 1845 from north-east India (Arunachal Pradesh) is described, pictured, and compared with the related species.